Trailhead and parking area are on Boulder Path Road in Waterville Valley, NH. Boulder Path Road leaves the north side of Rt. 49 11.2 miles northeast of Rt. 93 at exit 28. Note: this is 1.0 mile after passing Tripoli Road and entering the center of town. Drive 0.5 miles on Boulder Path Road and look for a large dirt parking area on the right just before Cascade Ridge Road. This is the parking for Snows Mountain Ski Area. This short loop hike over the minor knob on Snows Mountain's long northwest ridge provides hikers with limited views from ski trails on Snows Mountain Ski Area. It is best done as an addition to the hike to Waterville Cascades. The hike begins at the Snows Mountain Ski Area parking. Cross Cascade Ridge Road and head across the grass past the sign for Cascade Path, climbing alongside the road past several houses. Soon, the trail enters the woods, then passes Boulder Path on the left, 0.2 miles from the parking area. Just past this, the trail climbs back to the road and crosses it again. Continue up a ski trail for a short distance, then turn left into the woods at a trail sign. Quickly cross another ski trail, then in 0.2 miles, turn right onto Elephant Rock Trail (for Waterville Cascades, stay straight on Cascade Path; see directions on its separate page). This trail ascends easily, soon passing a large, rounded boulder known as Elephant Rock. The climb remains fairly easy for 0.3 miles. At the top, the trail comes out onto a ski trail with a small view of Mt. Osceola and its impressive cliffs. Turn left and follow the ski trail to the chairlift at the ski area summit. On the way, look to the right for another limited view to distant mountains. Behind the chairlift, an old dirt road goes off to the left. Stay to the right and enter the woods at a sign for Greeley Ledge Trail. Descend through a bouldery forest for 0.2 miles, then turn right onto Snows Mountain Trail. Continue down at an easier grade for 0.4 miles. 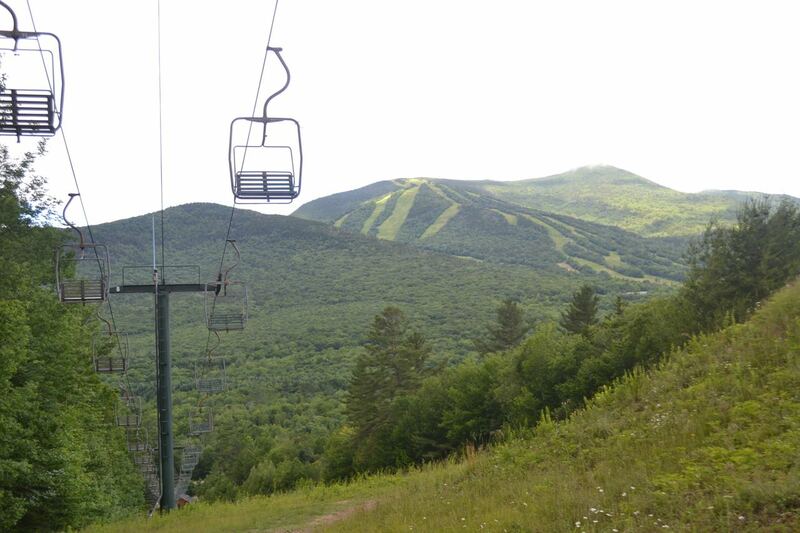 The trail then emerges below the chairlift on a wide ski trail with views across to Mt. Tecumseh and its ski area. Head down the ski trail along the lift line. At the bottom, pass a ski jump, stay to the right of the ski area buildings, and exit into the parking area.